F SCOTLAND'S MANY ICONS, tartan is the most instantly recognisable. From the Highland Games circuits of North America and Europe to the fashion catwalks of Milan, its provenance is unmistakable. It is Scotland's very own international brand identity, and what makes this all the more remarkable is that no other country lays claim to it. In the course of excavations at Qizilchoqa, a city that existed two millennia ago in the Taklimakan Desert, near Hami in North West China, three tombs were unearthed containing the mummified remains of four Caucasian men and two women. All were red headed and dressed in a tartan patterned cloth. Who were they? It's suggested that they belonged to a Celtic tribe who migrated along the silk road rather than taking the westward route favoured by most Celts, across Europe from the plains of Hungary, to colonise Spain, northern France, Ireland and parts of west coast Britain between the 1st and 6th centuries. 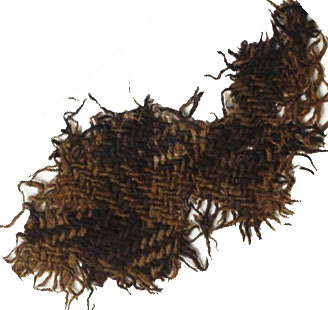 Similar ancient weaves attributed to the same Celtic provenance were discovered at Ancient Troy in Turkey, and are today in the collection of the Pushkin Museum in Moscow. But does this provide incontrovertible proof that it was our ancient Celtic ancestors who invented tartan? Probably not, but it surely confirms that they were weaving and wearing it long before they set foot in Scotland. In 1933, during an archaeological dig at Falkirk, an earthenware pot containing Roman coins and two scraps of two-toned woolen fabric was unearthed. The coins dated from between 83BC and 230AD, so it was considered safe to assume that the cloth was from the 3rd century when Falkirk was under Roman occupation. But once again the questions arise. Was tartan design imported into Scotland by the Romans? Or was it already in use by the time they arrived? Tradition has it that the Scots, a settled Celtic ethnic grouping from Northern Ireland, created Dál Riata (otherwise known as Dalriada) on the western seaboard of Scotland, a hundred years or more after the Romans departed. However, the time-span of their arrival in Kintyre, Lorn, and Cowal, is often disputed, and since Ulster is only a few sea miles distance across the North Channel, it seems only logical that there must have been constant earlier comings and goings through the centuries. Pictish carvings, such as those found on bone at Burray (Fossil & Vintage Centre) on Orkney, the sculptured stones of fighting warriors at Glamis, or the fearsome Rhynie Man, depict male figures in tunics but none of these images suggest that their clothes were patterned. 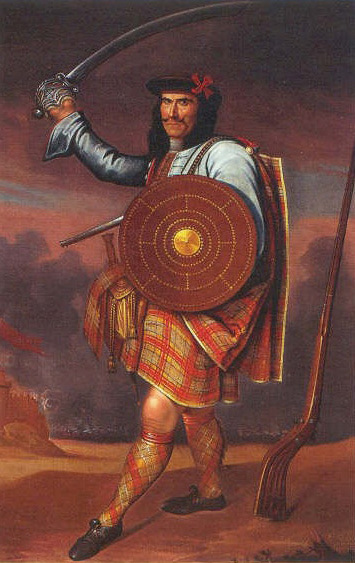 From the earliest documentation, Scotland’s Highlanders were described as “savages”, referring to the bareness of their legs and general nakedness. However, it is patently evident that their everyday attire, or lack of it, was employed for practical use, hunting and fighting, not for show. It was not until the 16th century that the existence of patterned cloth in Scotland was confirmed by an entry in the Treasurer's Accounts of 1538 which tells us that King James V had ordered an outfit of “Hieland tartane”. It is the ingenuity of the thread count that gives a tartan its individuality, not so much the colours employed, and what makes this especially remarkable is that such a mathematically ingenious formula was being manufactured in remote communities which were largely dismissed as primitive by the more populous regions of the South. It furthermore indicates that a sophisticated tribal society was emerging and it would soon be possible to identify districts from the colour patterns manufactured from the plant dyes available locally. And it was in this way, almost unintentionally, that clan tartans evolved. The majority of Highlanders would have made use of the material that was available to them locally, but others, especially those who travelled around the country, might easily have seen it as a fashion statement in much the same way that someone today selects a tweed. Look no further than the group of portraits commissioned by Sir James Grant of Grant from the artist Richard Waitt between 1713 and 1726. Each clansman is shown wearing a different tartan.